So your child/dog/cat/spouse has puked all over the carpet and you are wondering how to get it out, naturally, leaving no disgusting odour behind? It’s so easy! No, really, it is. Gross, yes – cleaning vomit out of carpet – or anywhere – is always going to be gross! But the important thing is getting rid of all the nasty smell that can be left behind (NOT just masking it), and leaving no stain. And of course, not using any nasty chemicals. So first I am going to show you a video of someone using this method to get dog vomit – of chocolate!! – out of carpet. And she has a lot of it to deal with. Below the video and I will give you step by step instructions and a couple of tips/alternative products you can use, plus an FAQ! Sonya Eckel is a super successful Norwex Consultant in America, who very clearly practices what she preaches 🙂 If you want to know how her dog got hold of so much chocolate (and how it looked the next day) watch to the end. First, scrape up as much of the solid mess as you can, ideally using something like an enviro cloth to pick the grossness up and drop it in the bin (the vomit, not the cloth), but to be honest, I might use a compostable plastic bag, inside out. I’m not perfect. Spray on plenty of the Norwex Carpet Stain Buster*, diluted about 1:16 (15 ml per cup/250ml) with water, in a spray bottle. Agitate the stain using a damp Norwex EnviroCloth**, being a little gentle if you have a loop pile. *The Norwex Carpet Stain Buster is an enzyme based cleaner, so it will not only clean the carpet, but it will take care of any left over smell, as the enzymes go to work on any organic matter left in the carpet. Keep in mind that deeper stains may actually come up further the next day, and you may need to then give it another go with the enviro cloth. (In the video you can see that for the biggest spot of chocolate dog vomit on Sonya’s carpet, she actually reapplies some more carpet stain buster too, and leaves it overnight). **The EnviroCloth is the most densely woven of all the Norwex cloths and so it is the go-to cloth for your hardest jobs. Here was my original post on the EnviroCloth. Q: I have the Norwex Mattress Cleaner and/or Odour Eliminator. They are both enzyme based products too, and I’ve heard they work on vomit. Which is better? The mattress cleaner is AWESOME at getting rid of the smell after you clean up the vomit with a damp envirocloth. I know lots of people who swear by it this way, and even take it on road trips in case their kids puke in the car. However, the mattress cleaner will not clean up the STAIN as effectively as the carpet cleaner – so it kinda depends how quickly you clean up the vomit and what was in it (in the video – with chocolate – well, I suspect the carpet cleaner was essential! ), AND the mattress cleaner is not recommended for wool (so don’t use it on a wool carpet). Also, the mattress cleaner cannot be diluted so it’s nowhere near as economical. On the other hand, if your dog pukes and you don’t have the carpet cleaner? By all means, give the mattress cleaner a try (as long as it’s not wool)!! The odour eliminator is a similar story – it will deal with any vomit smell left in the carpet, but not really help with the stain. It should also be diluted (1:8 in water), so it’s pretty cost-effective. I used the odour eliminator extensively to deal with cat urine in our carpet, when we had an old cat with failing kidneys, who frequently peed in the house. It was SUCH a life saver! Q: Can I use the Carpet Stain Buster on my wool carpet? A: Yes. Don’t use the mattress cleaner on wool, but the carpet cleaner or odour eliminator will be fine. Q: Can I use the Carpet Stain Buster for shampooing the whole carpet? A: Yes, you can. Use 320ml in 1 litre of water. Q: I’ve heard you can use it as a pre-wash stain remover in the laundry too, is that right? A: Yes, use it diluted, as for spot cleaner the carpet, spray on and leave for about 10 minute before washing. Keep in mind it will work best with organic stains like mould, mildew, blood, urine, dirt & grass. And vomit! Q: Do I really have to dilute the stain buster? Can’t I just spray it on directly? A: I will be really honest and say that I often just wet the stain first and then give it a few sprays with the neat product, because I am too lazy to dilute it. BUT, do this at your own risk (I would definitely test it on an out of the way spot first) AND, realise that you probably use it up more quickly this way. Actually though, if your stain is particularly bad (and maybe hasn’t responded to the dilute version), using it neat might be worthwhile – but as I said, always test on an out of the way spot first. Q. My carpet is ScotchGarded. Can I use the carpet stain buster? A: No. The ScotchGard™ will prevent the carpet stain buster from penetrating the fibres to remove stains, and several applications will also start to remove the scotchgard. However, do you want a chemical coating over your carpet? Check out this short article on Apartment Therapy for why you might not: Is There a Non-Toxic Stain-Resistant Fabric Protector. Q: Can I use the Carpet Stain Buster on my sofa or dining chairs? A: Yes (keeping in mind the point above about ScotchGard). Q. My Norwex consultant told me to just try cleaning carpet stains with a damp Envirocloth? Do I really need this extra product? A. It depends on the stain! I often tell my customers the same thing. 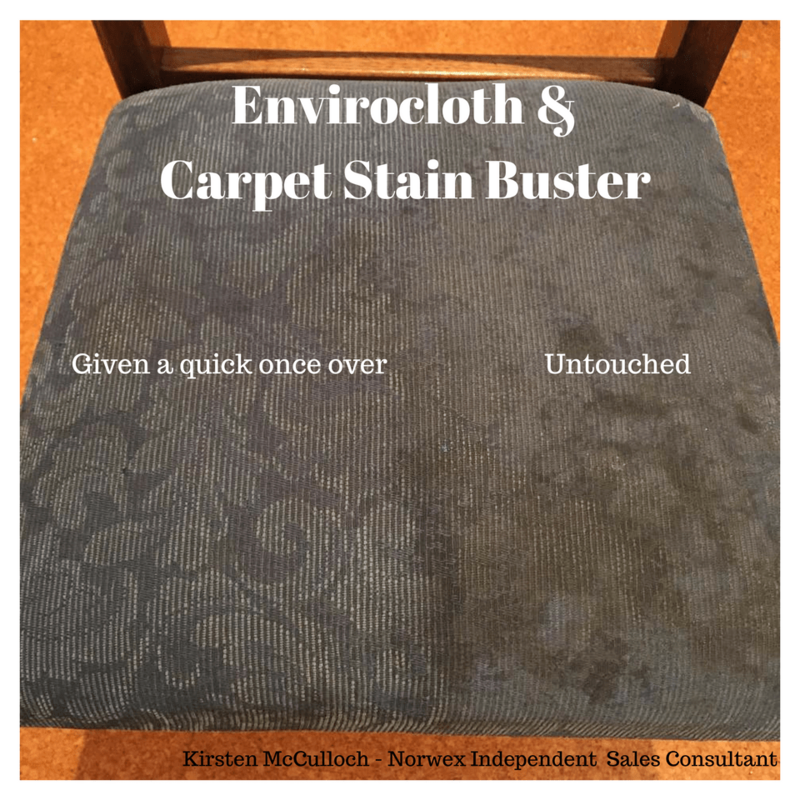 I have gotten many old stains out of the carpet, when I am doing demos at people’s homes, with just a damp envirocloth, so I ALWAYS recommend just trying that first. However, sometimes it’s not enough. And when there’s something stinky involved like vomit… then the enzymes are really your friends! Q: Can you come to my house and try it out on my stain, before I buy it? Over to you – do you have a nasty vomit smell story to share? How did you get rid of it? ← How to Clean Your Oven with No Nasty Chemicals! I posted this on my facebook page and a friend almost immediately commented “This has been a lifesaver for me over the past few days.” Evidently one of her daughters was vomiting. Erk! Thanks Kirsten! Watched the video and looks promising. Will certainly give it a try. Hi Kirsten. Thank you for this carpet cleaning guide. Cleaning up vomit is never fun, but your post makes the idea easier. Should you let the Norwex sit on the stain for a few minutes before scrubbing?